There has always been much discussion within the lodge as to how the name “anima” came about to be the Lodge name. I have heard many a theory I have my own thought but let us look at the twenty-four (24) volume of the Oxford English Dictionary its definition of the word is as follows. The word “anima” is Carl Jung (1875-1961) the famous Swiss psychiatrist definition of the word. That is the English definition of the word “anima” from Latin. Jung identified the anima as being the unconscious feminine component of men and the animus as the unconscious masculine component in women. However this is rarely taken as a literal definition; many modern day Jungian practitioners believe that every person has both an anima and animus. Jung stated that the anima and animus act as guides to the unconscious unified Self, and that forming an awareness and a connection with the anima or animus is one of the most difficult and rewarding steps in psychological growth. Jung reported that he identified his anima as she spoke to him, as an inner voice, unexpectedly one day. Often when people ignore the anima or animus complexes, the anima the anima or animus vies for attention by projecting itself on others. This explains, according to Jung, why we are sometimes immediately attracted to certain strangers: we see our anima or animus in them. Love at first sight is an example of anima and animus projection. Moreover, people who strongly identify with their gender role (e. g. a man who acts aggressively and never cries) have not actively recognized or engaged their anima or animus. Jung attributes human rational thought to be male nature, while the irrational aspect is considered to be natural female. Consequently, irrational moods are the progenies of the male anima shadow and irrational opinions of the female animus shadow. The seeds of the proposal to form Lodge Anima Glasgow were sown in casual conversation between two Brothers. Members of the cinema industry. They remarked on the great difficulty caused through the nature of their employment. And the hours in which that employment demanded their greatest attention preventing them and many others in the industry from being able to attend the regular meetings of their Lodges. They thought that this difficulty could be overcome if a Lodge was in existence which met in the afternoon of a certain day. Inquiry revealed that only one Lodge in the Province of Glasgow met in the afternoon but the meetings of this Lodge being held on a Thursday. Which to the members of the cinematic industry was an impossible day to attend meetings. They considered that the only way out of their difficulty was to endeavour to form another daylight Lodge to meet on a day which would be suitable to members of their industry. They then submitted their views on the matter to a few well known Brethren and it was decided to proceed with the formation of a new Lodge if sufficient numbers of founder members could be secured. A small committee was then formed to consider the scheme and a copy of petition for a new Charter having been received from the Grand Secretary, interested Brethren to the number of sixty-five placed their names on the petition, praying that this Charter be granted. The Charter was granted on 5th August, 1920, and the Lodge consecrated on 3rd September 1920, by Bro A. A. Hagart Speirs, of Elderslie, D. L., J. P., Right Worshipful Provincial Grand Master of Glasgow. The above does not mention who the two Brothers were which would be of interest to not only Anima members but other Masonic Brethren. A fuller detail of the Consecration and Erection of our Lodge will be found further on in our history. Our sponsor Lodges are Lodge Athole 413 and Lodge Montefiore 753. I have enquired in both of these Lodges of records in their minute books of details of the sponsoring of our Lodge unfortunately it seems like our Lodge the minute book for 1920 is also lost. However I have found from the archives of Lodge Montefiore No 753, which are kept in the Garnethill Synagogue, Hill Street Glasgow, a large photograph of the installation dinner of Bro Philip Berger R W M 1943-44 with Office Bearers taken in 1943. As the minute book for that period is missing this is very interesting. THE PETITION for A CHARTER OF A LODGE ANIMA AND FOUNDER MEMBERS AND THEIR LODGES. I have now in my possession a photocopy of the original petition for charter of the Lodge along with the 61 (sixty-one) brothers who signed it far from solving many questions it rather adds to them. It has been said that there are 65 (sixty-five) founder members whom I believe is correct and the roll book of the lodge I think will confirm that. The bye laws of the Lodge for 1926 lists 61 (sixty-one) however it has four founder members missing from the petition and has four that have not signed the petition. These four I am informed all came from Lodge Anima No 3634 (EC) and were added to the list after. They I assume must be the four on the 1926 bye laws and will mention them after I try and give a complete run down of the petition. I do have to say it is sometimes difficult to make out some of the signatures on that petition but I will try it may be the webmaster will be given a copy of the petition and put it on the web site. The petition runs into five (5) pages counting the front cover. I am about to reproduce it as actuate as I can. I will afterwards give my comments on it and a breakdown of the Lodge or Lodges they were members of. Some brothers were members of more than one Lodge. The list is signed by each member and on one line and the Lodge or Lodges he is a member of. I am giving a page to each page of the petition so here goes the cover first then the petition two pages of signatures then the page of the sponsor Lodges with the R WMs and wardens of each Lodge. 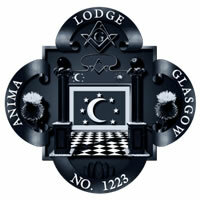 by the name and title of… Lodge Anima……Glasgow………………………………………..
obedience to the Constitution and Laws of Grand Lodge. William Carruthers Cambuslang R. A. No 153. Joseph Wm Thorpe Pollokshaws R. A. 153. OF ANCIENT FREE AND ACCEPTED MASONS OF SCOTLAND. and submitted for the favourable consideration of Grand Lodge. Provincial or District Grand Master. Starting from the cover of the petition and going through the 5 (five) pages counting the cover as a page. The first thing of note is the number given to the lodge at the top left hand corner of the cover. One can see the first number given is 1222 the last 2 has been scored 4 out and 3 written above in its place. This must be a clerical error and was corrected at a later date. From what I can see of the number it must have been rubber stamped. Further down the cover is written page 242 underneath 1920/21 and signed AC (it looks like a C) this I think must be the page on which our Lodge will be mentioned in Grand Lodge of Scotland minutes for 1920/21 and the then Grand Secretary initialed it. Near the bottom of the cover we read Lodged with Grand Secretary the number is not exactly clear is it 07 or 17 or 27 May 1920 that again is rubber stamped. I would rule out 27 only because the date it was submitted to Grand Committee 20 may 1920 and the Charter Granted by Grand Lodge 5 August 1920. The next page is the petition and is dated 14th April 1920 the idea of a Lodge Anima will have started well before that date one can only guess maybe late 1919 or early 1920. The first meeting place of the Lodge 100 West Regent Street Glasgow and name of the Lodge, Lodge Anima Glasgow. The petition and list of the first office bearers are given on page 1. The first meeting place of the Lodge is given and lodge name. Whoever was given the task of writing the office bearers names must have made a mistake in the writing of William Silby Shepherd Junior Warden as written on the margin Selby. For by the writing it was one and the same person who wrote it possibly the brother who was to be secretary James Wallace that is only my guess. However all those named on the petition were installed in their office at the consecration of the Lodge. The next two pages are both numbered 2 and contain the signatures of 61 (sixty-one) founder members however according to the 1926 bye laws it also lists 61 founder members BUT four on their list are not on the petition. These four I am reliably informed by Bro Robert Cooper Curator The Grand Lodge of Scotland Museum and Library were added after and all came from Lodge Anima No 3634 (EC) and were all Past Masters and founder members of that Lodge as well. Their names will not be found on any of the 5 (five) pages listed here. Three you will read of are already mentioned further in the history Bros Heron, Cross, Rockett the other being Bro Wilfred E L Day master Lodge Anima No 3634 (EC) 1917-18. These four brethren have the unique honor of being founder members of both Lodges Anima Scotland and England. On reading the list of founder members on pages 2 and 2 for some signatures it is not easy to decipher them I suppose someone will say look at the Lodge roll book but if they write the same as the petition we are back to square one. It will also be seen that some brothers are members of more than one Lodge. Some as far as I can see have also put Royal Arch numbers in. Some of the named Lodges are no longer with us unfortunately. There are names or corrections written in the margin of both sheets. On what I call the first of the number 2 sheets the second line from the top the word obedience has been underlined and not on the other 2 sheet. Was it possibly being by the Lodge Secretary to be, and also in the margin of the Charter Names. Then fourth name down again in the margin written St John Bucksburn 795 followed by Robert George Booth twice the first being scored out. Then again in the margin fifth name down St Kentigern 976 by George Albert Greenwood twice well the Albert is missing the first time and I am not 100% certain it is Albert. The second of the pages number 2 has William Connell Albert Edward 592 in the margin between the second and third line down. The third line down on that sheet has Jm Williams scored out then Albert Edwards 592 was that a mistake or not the mystery deepens. The next page numbered 3 (three) lists the R W M and Wardens of our sponsor Lodges Montefiore 753 and Athole 413 the meeting approved by Provincial Grand Lodge of Glasgow 4th May 1920 signed by Provincial Grand Master Bro A A Hagart Speirs and Provincial Grand Secretary something Campbell/. The day of the annual election of office bearers 3rd Friday in November and Lodge colours black and white which I have to say some people thought were black and silver this writer included. I intend to give a list of all the Lodges where the founder members came from and in the order of roll of lodges as listed by The Grand Lodge of Scotland as follows and any comments I have at varies brethren in that Lodge. NOTE; SOME BROTHERS WERE MEMBERS OF MORE THAN ONE LODGE. I will also give what Province the Lodge is in as at present it may be that some Lodges in the past have changed Provinces it has happened in the past but I do not know if any of the Lodges listed here have changed. This will come after Lodge name. 28 F St JOHN KILWINNING (Dunbartonshire) Bro JOSPH DUNCAN MITCHELL First Lodge treasurer. 119 St JOHN (Kincardineshire) Bro HYMAN SHAVRIN see also Montefiore 753 (this entry is confusing is says Royal Arch 119 weather it is a Lodge or Royal Arch number I do not know all 119 says is St John. 315 ROYAL ARCH (?) Bro ARTHUR CYRIL FIELD and is also a member of Montefiore 753, Lodge 315 is no longer listed on the roll of Grand Lodge that is if it was a Lodge or a Royal Arch. 335 DUNOON ARGYLL (Argyll and The Isles) Bro CHARLES HUNTER WILLIAMS. 976 St KENTIGERN (Glasgow) Bro GEORGE (MIDDLE NAME CANNOT MAKE OUT) GREENWOOD Bro ALBERT ERNEST PICKARD. Note; this lodge no longer exists. * These Lodges recommended our Lodge on the petition submitted to Grand Lodge of Scotland. *1 Bro HYMAN SHAVRIN as S W Lodge Montefiore 753 was one of the signatures of recommendations of Lodge Anima. It will also be seen further on in objections to our Lodge being founded he recommended petition be approved. However it says he was master of Lodge Montefiore 753 the roll of past masters of that Lodge has no mention of him ever being on the chair.